For the past five general elections, the constituency of Houghton & Sunderland South (or Sunderland South as it used to be called) has been the first to declare. It will almost certainly repeat the feat a sixth time, and so provide us with the first result of the 2015 general election – probably within an hour of the polls closing. Sunderland South always been a safe Labour seat and will be again this year. But that doesn’t mean the result won’t be eagerly awaited and picked over at enormous length by politicians and pundits from the second it is announced. That result represented a swing from Labour to the Conservatives of 8.5%. When this calculation became known on the night of the 2010 election, Tory spirits rocketed, for this was exactly the sort of swing that would, if repeated nationwide, deliver a majority Conservative government. We all know what happened next. That such a swing did not materialise across the UK is a lesson to which we should all pay heed this year. What takes place in Sunderland South will not be what takes place elsewhere in the country. It might not even be what takes place elsewhere in north-east England. This time round Labour is facing opposition from the Greens, who didn’t field a candidate in 2010, along with the Tories, the Lib Dems and Ukip. I don’t except the Greens to come anywhere except last, meaning the order in which the parties finish should be Labour, Conservative, Ukip, Lib Dem, Green. Both of these factors ought to provide useful clues about what could happen elsewhere. 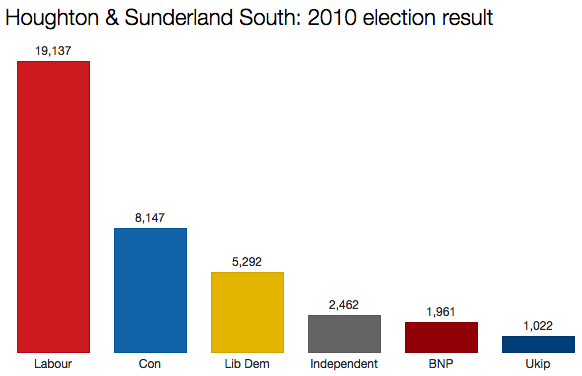 Last time in Sunderland South, Chris Mullin stood down as the MP and Phillipson was the new candidate. So if the “second time [incumbency] bonus” theory holds, Labour should do better there than in general this time. Labour will be looking for a big swing, as national swing and an incumbency bonus take effect and they hoover up former Lib Dem voters. However, offsetting this somewhat is UKIP, who in a seat like this are more likely to take away Labour voters than Tories. Overall they will be satisfied with a majority similar to 2005. The Tories are hoping for 20%+ and finishing comfortably ahead of UKIP. A 15%+ result for UKIP here might paradoxically be bad news for them, at least in the short term, as it would indicate that a decent proportion of their 12-15% national vote share is being completely wasted in safe Labour seats in Northern England, rather than focussed in the ageing seaside resorts where they stand a chance of winning seats. The Lib Dems will be happy to keep their £500. James and Alex: thanks both for your replies. I was wondering if Labour ought to do better here, and you’ve provided some useful reasons why this should be the case. The SNP’s advance: will it really be as big as Lord Ashcroft’s polls suggest?